The molecular formula of anhydrous theophylline is C7H8N4O2 with a molecular weight of 180.17. 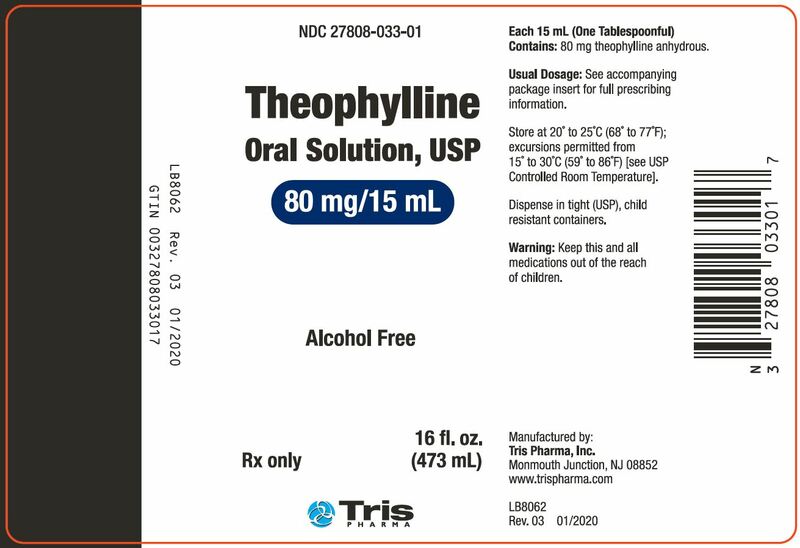 Theophylline Oral Solution, USP is available as a solution intended for oral administration, containing 80 mg of theophylline anhydrous per 15 mL (one tablespoonful). Theophylline Oral Solution is alcohol free. Theophylline Oral Solution also contains the following inactive ingredients: anhydrous citric acid, glycerin, methylparaben, orange oil, polysorbate 80, propylene glycol, purified water, sodium benzoate, sodium citrate, sodium saccharin, and sorbitol solution. Theophylline Oral Solution has pH of 4.3 to 4.7. Theophylline has two distinct actions in the airways of patients with reversible obstruction; smooth muscle relaxation (i.e., bronchodilation) and suppression of the response of the airways to stimuli (i.e., non-bronchodilator prophylactic effects). While the mechanisms of action of theophylline are not known with certainty, studies in animals suggest that bronchodilatation is mediated by the inhibition of two isozymes of phosphodiesterase (PDE III and, to a lesser extent, PDE IV) while non-bronchodilator prophylactic actions are probably mediated through one or more different molecular mechanisms, that do not involve inhibition of PDE III or antagonism of adenosine receptors. Some of the adverse effects associated with theophylline appear to be mediated by inhibition of PDE III (e.g., hypotension, tachycardia, headache, and emesis) and adenosine receptor antagonism (e.g., alterations in cerebral blood flow). Bronchodilation occurs over the serum theophylline concentration range of 5 to 20 mcg/mL. Clinically important improvement in symptom control has been found in most studies to require peak serum theophylline concentrations > 10 mcg/mL, but patients with mild disease may benefit from lower concentrations. At serum theophylline concentrations > 20 mcg/mL, both the frequency and severity of adverse reactions increase. In general, maintaining peak serum theophylline concentrations between 10 and 15 mcg/mL will achieve most of the drugâ€™s potential therapeutic benefit while minimizing the risk of serious adverse events. Overview Theophylline is rapidly and completely absorbed after oral administration in solution or immediate-release solid oral dosage form. Theophylline does not undergo any appreciable pre-systemic elimination, distributes freely into fat-free tissues and is extensively metabolized in the liver. Table I. Mean and range of total body clearance and half-life of theophylline related to age and altered physiological states. For various North American patient populations from literature reports. Different rates of elimination and consequent dosage requirements have been observed among other peoples. â€ â€ Reported range or estimated range (mean ± 2 SD) where actual range not reported. â€ NR = not reported or not reported in a comparable format. Absorption Theophylline is rapidly and completely absorbed after oral administration in solution or immediate-release solid oral dosage form. After a single dose of 5 mg/kg in adults, a mean peak serum concentration of about 10 mcg/mL (range 5 to 15 mcg/mL) can be expected 1 to 2 hr after the dose. Co-administration of theophylline with food or antacids does not cause clinically significant changes in the absorption of theophylline from immediate-release dosage forms. Distribution Once theophylline enters the systemic circulation, about 40% is bound to plasma protein, primarily albumin. Unbound theophylline distributes throughout body water, but distributes poorly into body fat. The apparent volume of distribution of theophylline is approximately 0.45 L/kg (range 0.3 to 0.7 L/kg) based on ideal body weight. Theophylline passes freely across the placenta, into breast milk and into the cerebrospinal fluid (CSF). Saliva theophylline concentrations approximate unbound serum concentrations, but are not reliable for routine or therapeutic monitoring unless special techniques are used. An increase in the volume of distribution of theophylline, primarily due to reduction in plasma protein binding, occurs in premature neonates, patients with hepatic cirrhosis, uncorrected acidemia, the elderly and in women during the third trimester of pregnancy. In such cases, the patient may show signs of toxicity at total (bound + unbound) serum concentrations of theophylline in the therapeutic range (10 to 20 mcg/mL) due to elevated concentrations of the pharmacologically active unbound drug. Similarly, a patient with decreased theophylline binding may have a sub-therapeutic total drug concentration while the pharmacologically active unbound concentration is in the therapeutic range. If only total serum theophylline concentration is measured, this may lead to an unnecessary and potentially dangerous dose increase. In patients with reduced protein binding, measurement of unbound serum theophylline concentration provides a more reliable means of dosage adjustment than measurement of total serum theophylline concentration. Generally, concentrations of unbound theophylline should be maintained in the range of 6 to 12 mcg/mL. Metabolism Following oral dosing, theophylline does not undergo any measurable first-pass elimination. In adults and children beyond one year of age, approximately 90% of the dose is metabolized in the liver. Biotransformation takes place through demethylation to 1-methylxanthine and 3-methylxanthine and hydroxylation to 1,3-dimethyluric acid. 1-methylxanthine is further hydroxylated, by xanthine oxidase, to 1-methyluric acid. About 6% of a theophylline dose is N-methylated to caffeine. Theophylline demethylation to 3-methylxanthine is catalyzed by cytochrome P-450 1A2, while cytochromes P-450 2E1 and P-450 3A3 catalyze the hydroxylation to 1,3-dimethyluric acid. Demethylation to 1-methylxanthine appears to be catalyzed either by cytochrome P-450 1A2 or a closely related cytochrome. In neonates, the N-demethylation pathway is absent while the function of the hydroxylation pathway is markedly deficient. The activity of these pathways slowly increases to maximal levels by one year of age. Both the N-demethylation and hydroxylation pathways of theophylline biotransformation are capacity-limited. Due to the wide intersubject variability of the rate of theophylline metabolism, non-linearity of elimination may begin in some patients at serum theophylline concentrations < 10 mcg/mL. Since this non-linearity results in more than proportional changes in serum theophylline concentrations with changes in dose, it is advisable to make increases or decreases in dose in small increments in order to achieve desired changes in serum theophylline concentrations (see DOSAGE AND ADMINISTRATION, Table VI). Accurate prediction of dose-dependency of theophylline metabolism in patients a priori is not possible, but patients with very high initial clearance rates (i.e., low steady state serum theophylline concentrations at above average doses) have the greatest likelihood of experiencing large changes in serum theophylline concentration in response to dosage changes. Excretion In neonates, approximately 50% of the theophylline dose is excreted unchanged in the urine. Beyond the first three months of life, approximately 10% of the theophylline dose is excreted unchanged in the urine. The remainder is excreted in the urine mainly as 1,3-dimethyluric acid (35 to 40%), 1-methyluric acid (20 to 25%) and 3-methylxanthine (15 to 20%). Since little theophylline is excreted unchanged in the urine and since active metabolites of theophylline (i.e., caffeine, 3-methylxanthine) do not accumulate to clinically significant levels even in the face of end-stage renal disease, no dosage adjustment for renal insufficiency is necessary in adults and children >3 months of age. In contrast, the large fraction of the theophylline dose excreted in the urine as unchanged theophylline and caffeine in neonates requires careful attention to dose reduction and frequent monitoring of serum theophylline concentrations in neonates with reduced renal function (see WARNINGS). Serum Concentrations at Steady State After multiple doses of theophylline, steady state is reached in 30 to 65 hours (average 40 hours) in adults. At steady state, on a dosage regimen with 6-hour intervals, the expected mean trough concentration is approximately 60% of the mean peak concentration, assuming a mean theophylline half-life of 8 hours. The difference between peak and trough concentrations is larger in patients with more rapid theophylline clearance. In patients with high theophylline clearance and half-lives of about 4 to 5 hours, such as children age 1 to 9 years, the trough serum theophylline concentration may be only 30% of peak with a 6-hour dosing interval. In these patients a slow release formulation would allow a longer dosing interval (8 to 12 hours) with a smaller peak/trough difference. Geriatric The clearance of theophylline is decreased by an average of 30% in healthy elderly adults (> 60 yrs) compared to healthy young adults. Careful attention to dose reduction and frequent monitoring of serum theophylline concentrations are required in elderly patients (see WARNINGS). Theophylline oral solution is indicated for the treatment of the symptoms and reversible airflow obstruction associated with chronic asthma and other chronic lung diseases, e.g., emphysema and chronic bronchitis. Theophylline oral solution is contraindicated in patients with a history of hypersensitivity to theophylline or other components in the product. Drug Interactions Adding a drug that inhibits theophylline metabolism (e.g., cimetidine, erythromycin, tacrine) or stopping a concurrently administered drug that enhances theophylline metabolism (e.g., carbamazepine, rifampin). (see PRECAUTIONS, Drug Interactions, Table II). Increases in the dose of theophylline should not be made in response to an acute exacerbation of symptoms of chronic lung disease since theophylline provides little added benefit to inhaled beta-2 selective agonists and systemically administered corticosteroids in this circumstance and increases the risk of adverse effects. A peak steady-state serum theophylline concentration should be measured before increasing the dose in response to persistent chronic symptoms to ascertain whether an increase in dose is safe. Before increasing the theophylline dose on the basis of a low serum concentration, the clinician should consider whether the blood sample was obtained at an appropriate time in relationship to the dose and whether the patient has adhered to the prescribed regimen (see PRECAUTIONS, Laboratory Tests). To guide a dose increase, the blood sample should be obtained at the time of the expected peak serum theophylline concentration; 1 to 2 hours after a dose at steady-state. For most patients, steady-state will be reached after 3 days of dosing when no doses have been missed, no extra doses have been added, and none of the doses have been taken at unequal intervals. A trough concentration (i.e., at the end of the dosing interval) provides no additional useful information and may lead to an inappropriate dose increase since the peak serum theophylline concentration can be two or more times greater than the trough concentration with an immediate-release formulation. If the serum sample is drawn more than two hours after the dose, the results must be interpreted with caution since the concentration may not be reflective of the peak concentration. In contrast, when signs or symptoms of theophylline toxicity are present, the serum sample should be obtained as soon as possible, analyzed immediately, and the result reported to the clinician without delay. In patients in whom decreased serum protein binding is suspected (e.g., cirrhosis, women during the third trimester of pregnancy), the concentration of unbound theophylline should be measured and the dosage adjusted to achieve an unbound concentration of 6 to 12 mcg/mL. As a result of its pharmacological effects, theophylline at serum concentrations within the 10 to 20 mcg/mL range modestly increases plasma glucose (from a mean of 88 mg% to 98 mg%), uric acid (from a mean of 4 mg/dl to 6 mg/dl), free fatty acids (from a mean of 451 µÐ„q/l to 800 µÐ„q/l, total cholesterol (from a mean of 140 to 160 mg/dl), HDL (from a mean of 36 to 50 mg/dl), HDL/LDL ratio (from a mean of 0.5 to 0.7), and urinary free cortisol excretion (from a mean of 44 to 63 mcg/24 hr). Theophylline at serum concentrations within the 10 to 20 mcg/mL range may also transiently decrease serum concentrations of triiodothyronine (144 before, 131 after one week and 142 ng/dl after 4 weeks of theophylline). The clinical importance of these changes should be weighed against the potential therapeutic benefit of theophylline in individual patients. Table II. Clinically significant drug interactions with theophylline*. *Refer to PRECAUTIONS, Drug Interactions for further information regarding table. **Average effect on steady state theophylline concentration or other clinical effect for pharmacologic interactions. Individual patients may experience larger changes in serum theophylline concentration than the value listed. The Effect Of Other Drugs On Theophylline Serum Concentration Measurements: Most serum theophylline assays in clinical use are immunoassays which are specific for theophylline. Other xanthines such as caffeine, dyphylline, and pentoxifylline are not detected by these assays. Some drugs (e.g., cefazolin, cephalothin), however, may interfere with certain HPLC techniques. Caffeine and xanthine metabolites in neonates or patients with renal dysfunction may cause the reading from some dry reagent office methods to be higher than the actual serum theophylline concentration. Long term carcinogenicity studies have been carried out in mice (oral doses 30 to 150 mg/kg) and rats (oral doses 5 to 75 mg/kg). Results are pending. In a 14 week continuous breeding study, theophylline, administered to mating pairs of B6C3F1 mice at oral doses of 120, 270 and 500 mg/kg (approximately 1 to 3 times the human dose on a mg/m2 basis) impaired fertility, as evidenced by decreases in the number of live pups per litter, decreases in the mean number of litters per fertile pair, and increases in the gestation period at the high dose as well as decreases in the proportion of pups born alive at the mid and high dose. In 13 week toxicity studies, theophylline was administered to F344 rats and B6C3F1 mice at oral doses of 40 to 300 mg/kg (approximately 2 times the human dose on a mg/m2 basis). At the high dose, systemic toxicity was observed in both species including decreases in testicular weight. Category C: There are no adequate and well controlled studies in pregnant women. Additionally, there are no teratogenicity studies in non-rodents (e.g., rabbits). Theophylline was not shown to be teratogenic in CD-1 mice at oral doses up to 400 mg/kg, approximately 2 times the human dose on a mg/m2 basis or in CD-1 rats at oral doses up to 260 mg/kg, approximately 3 times the recommended human dose on a mg/m2 basis. At a dose of 220 mg/kg, embryotoxicity was observed in rats in the absence of maternal toxicity. Theophylline is excreted into breast milk and may cause irritability or other signs of mild toxicity in nursing human infants. The concentration of theophylline in breast milk is about equivalent to the maternal serum concentration. An infant ingesting a liter of breast milk containing 10 to 20 mcg/mL of theophylline per day is likely to receive 10 to 20 mg of theophylline per day. Serious adverse effects in the infant are unlikely unless the mother has toxic serum theophylline concentrations. Theophylline is safe and effective for the approved indications in pediatric patients (see, INDICATIONS AND USAGE). The maintenance dose of theophylline must be selected with caution in pediatric patients since the rate of theophylline clearance is highly variable across the age range of neonates to adolescents (see CLINICAL PHARMACOLOGY, Table I, WARNINGS, and DOSAGE AND ADMINISTRATION, Table V). Due to the immaturity of theophylline metabolic pathways in infants under the age of one year, particular attention to dosage selection and frequent monitoring of serum theophylline concentrations are required when theophylline is prescribed to pediatric patients in this age group. Elderly patients are at significantly greater risk of experiencing serious toxicity from theophylline than younger patients due to pharmacokinetic and pharmacodynamic changes associated with aging. Theophylline clearance is reduced in patients greater than 60 years of age, resulting in increased serum theophylline concentrations in response to a given theophylline dose. Protein binding may be decreased in the elderly resulting in a larger proportion of the total serum theophylline concentration in the pharmacologically active unbound form. Elderly patients also appear to be more sensitive to the toxic effects of theophylline after chronic overdosage than younger patients. For these reasons, the maximum daily dose of theophylline in patients greater than 60 years of age ordinarily should not exceed 400 mg/day unless the patient continues to be symptomatic and the peak steady state serum theophylline concentration is <10 mcg/mL (see DOSAGE AND ADMINISTRATION). Theophylline doses greater than 400 mg/d should be prescribed with caution in elderly patients. Adverse reactions associated with theophylline are generally mild when peak serum theophylline concentrations are <20 mcg/mL and mainly consist of transient caffeine-like adverse effects such as nausea, vomiting, headache, and insomnia. When peak serum theophylline concentrations exceed 20 mcg/mL, however, theophylline produces a wide range of adverse reactions including persistent vomiting, cardiac arrhythmias, and intractable seizures which can be lethal (see OVERDOSAGE). The transient caffeine-like adverse reactions occur in about 50% of patients when theophylline therapy is initiated at doses higher than recommended initial doses (e.g.,>300 mg/day in adults and >12 mg/kg/day in children beyond >1 year of age). During the initiation of theophylline therapy, caffeine-like adverse effects may transiently alter patient behavior, especially in school age children, but this response rarely persists. Initiation of theophylline therapy at a low dose with subsequent slow titration to a predetermined age-related maximum dose will significantly reduce the frequency of these transient adverse effects (see DOSAGE AND ADMINISTRATION, Table V). In a small percentage of patients (<3% of children and <10% of adults) the caffeine-like adverse effects persist during maintenance therapy, even at peak serum theophylline concentrations within the therapeutic range (i.e., 10 to 20 mcg/mL). Dosage reduction may alleviate the caffeine-like adverse effects in these patients, however, persistent adverse effects should result in a reevaluation of the need for continued theophylline therapy and the potential therapeutic benefit of alternative treatment. Other adverse reactions that have been reported at serum theophylline concentrations <20 mcg/mL include diarrhea, irritability, restlessness, fine skeletal muscle tremors, and transient diuresis. In patients with hypoxia secondary to COPD, multifocal atrial tachycardia and flutter have been reported at serum theophylline concentrations â‰¥15 mcg/mL. There have been a few isolated reports of seizures at serum theophylline concentrations <20 mcg/mL in patients with an underlying neurological disease or in elderly patients. The occurrence of seizures in elderly patients with serum theophylline concentrations <20 mcg/mL may be secondary to decreased protein binding resulting in a larger proportion of the total serum theophylline concentration in the pharmacologically active unbound form. The clinical characteristics of the seizures reported in patients with serum theophylline concentrations <20 mcg/mL have generally been milder than seizures associated with excessive serum theophylline concentrations resulting from an overdose (i.e., they have generally been transient, often stopped without anticonvulsant therapy, and did not result in neurological residual). * These data are derived from two studies in patients with serum theophylline concentrations >30 mcg/mL. In the first study (Study #1 - Shanon, Ann Intern Med 1993; 119:1161-67), data were prospectively collected from 249 consecutive cases of theophylline toxicity referred to a regional poison center for consultation. In the second study (Study #2 - Sessler, Am J Med 1990;88:567-76), data were retrospectively collected from 116 cases with serum theophylline concentrations >30 mcg/mL among 6000 blood samples obtained for measurement of serum theophylline concentrations in three emergency departments. Differences in the incidence of manifestations of theophylline toxicity between the two studies may reflect sample selection as a result of study design (e.g., in Study #1, 48% of the patients had acute intoxications versus only 10% in Study #2) and different methods of reporting results. ** NR = Not reported in a comparable manner. Several studies have described the clinical manifestations of theophylline overdose and attempted to determine the factors that predict life-threatening toxicity. In general, patients who experience an acute overdose are less likely to experience seizures than patients who have experienced a chronic overdosage, unless the peak serum theophylline concentration is >100 mcg/mL. After a chronic overdosage, generalized seizures, life-threatening cardiac arrhythmias, and death may occur at serum theophylline concentrations >30 mcg/mL. The severity of toxicity after chronic overdosage is more strongly correlated with the patientâ€™s age than the peak serum theophylline concentration; patients >60 years are at the greatest risk for severe toxicity and mortality after a chronic overdosage. Pre-existing or concurrent disease may also significantly increase the susceptibility of a patient to a particular toxic manifestation, e.g., patients with neurologic disorders have an increased risk of seizures and patients with cardiac disease have an increased risk of cardiac arrhythmias for a given serum theophylline concentration compared to patients without the underlying disease. Treatment of seizures Because of the high morbidity and mortality associated with theophylline-induced seizures, treatment should be rapid and aggressive. Anticonvulsant therapy should be initiated with an intravenous benzodiazepine, e.g., diazepam, in increments of 0.1 to 0.2 mg/kg every 1 to 3 minutes until seizures are terminated. Repetitive seizures should be treated with a loading dose of phenobarbital (20 mg/kg infused over 30 to 60 minutes). Case reports of theophylline overdose in humans and animal studies suggest that phenytoin is ineffective in terminating theophylline-induced seizures. The doses of benzodiazepines and phenobarbital required to terminate theophylline-induced seizures are close to the doses that may cause severe respiratory depression or respiratory arrest; the clinician should therefore be prepared to provide assisted ventilation. Elderly patients and patients with COPD may be more susceptible to the respiratory depressant effects of anticonvulsants. Barbiturate-induced coma or administration of general anesthesia may be required to terminate repetitive seizures or status epilepticus. General anesthesia should be used with caution in patients with theophylline overdose because fluorinated volatile anesthetics may sensitize the myocardium to endogenous catecholamines released by theophylline. Enflurane appears less likely to be associated with this effect than halothane and may, therefore, be safer. Neuromuscular blocking agents alone should not be used to terminate seizures since they abolish the musculoskeletal manifestations without terminating seizure activity in the brain. Anticipate Need for Anticonvulsants In patients with theophylline overdose who are at high risk for theophylline-induced seizures, e.g., patients with acute overdoses and serum theophylline concentrations >100 mcg/mL or chronic overdosage in patients >60 years of age with serum theophylline concentrations >30 mcg/mL, the need for anticonvulsant therapy should be anticipated. A benzodiazepine such as diazepam should be drawn into a syringe and kept at the patientâ€™s bedside and medical personnel qualified to treat seizures should be immediately available. In selected patients at high risk for theophylline-induced seizures, consideration should be given to the administration of prophylactic anticonvulsant therapy. Situations where prophylactic anticonvulsant therapy should be considered in high risk patients include anticipated delays in instituting methods for extracorporeal removal of theophylline (e.g., transfer of a high risk patient from one health care facility to another for extracorporeal removal) and clinical circumstances that significantly interfere with efforts to enhance theophylline clearance (e.g., a neonate where dialysis may not be technically feasible or a patient with vomiting unresponsive to antiemetics who is unable to tolerate multiple-dose oral activated charcoal). In animal studies, prophylactic administration of phenobarbital, but not phenytoin, has been shown to delay the onset of theophylline-induced generalized seizures and to increase the dose of theophylline required to induce seizures (i.e., markedly increases the LD50). Although there are no controlled studies in humans, a loading dose of intravenous phenobarbital (20 mg/kg infused over 60 minutes) may delay or prevent life-threatening seizures in high risk patients while efforts to enhance theophylline clearance are continued. Phenobarbital may cause respiratory depression, particularly in elderly patients and patients with COPD. Gastrointestinal decontamination Oral activated charcoal (0.5 g/kg up to 20 g and repeat at least once 1 to 2 hours after the first dose) is extremely effective in blocking the absorption of theophylline throughout the gastrointestinal tract, even when administered several hours after ingestion. If the patient is vomiting, the charcoal should be administered through a nasogastric tube or after administration of an antiemetic. Phenothiazine antiemetics such as prochlorperazine or perphenazine should be avoided since they can lower the seizure threshold and frequently cause dystonic reactions. A single dose of sorbitol may be used to promote stooling to facilitate removal of theophylline bound to charcoal from the gastrointestinal tract. Sorbitol, however, should be dosed with caution since it is a potent purgative which can cause profound fluid and electrolyte abnormalities, particularly after multiple doses. Commercially available fixed combinations of liquid charcoal and sorbitol should be avoided in young children and after the first dose in adolescents and adults since they do not allow for individualization of charcoal and sorbitol dosing. Ipecac syrup should be avoided in theophylline overdoses. Although ipecac induces emesis, it does not reduce the absorption of theophylline unless administered within 5 minutes of ingestion and even then is less effective than oral activated charcoal. Moreover, ipecac induced emesis may persist for several hours after a single dose and significantly decrease the retention and the effectiveness of oral activated charcoal. Serum Theophylline Concentration Monitoring The serum theophylline concentration should be measured immediately upon presentation, 2 to 4 hours later, and then at sufficient intervals, e.g., every 4 hours, to guide treatment decisions and to assess the effectiveness of therapy. Serum theophylline concentrations may continue to increase after presentation of the patient for medical care as a result of continued absorption of theophylline from the gastrointestinal tract. Serial monitoring of serum theophylline serum concentrations should be continued until it is clear that the concentration is no longer rising and has returned to non-toxic levels. Enhance clearance of theophylline Multiple-dose oral activated charcoal (e.g., 0.5 mg/kg up to 20 g, every two hours) increases the clearance of theophylline at least twofold by adsorption of theophylline secreted into gastrointestinal fluids. Charcoal must be retained in, and pass through, the gastrointestinal tract to be effective; emesis should therefore be controlled by administration of appropriate antiemetics. Alternatively, the charcoal can be administered continuously through a nasogastric tube in conjunction with appropriate antiemetics. A single dose of sorbitol may be administered with the activated charcoal to promote stooling to facilitate clearance of the adsorbed theophylline from the gastrointestinal tract. Sorbitol alone does not enhance clearance of theophylline and should be dosed with caution to prevent excessive stooling which can result in severe fluid and electrolyte imbalances. Commercially available fixed combinations of liquid charcoal and sorbitol should be avoided in young children and after the first dose in adolescents and adults since they do not allow for individualization of charcoal and sorbitol dosing. In patients with intractable vomiting, extracorporeal methods of theophylline removal should be instituted (see OVERDOSAGE, Extracorporeal Removal). Monitor the patient and obtain a serum theophylline concentration in 2 to 4 hours to insure that the concentration is not increasing. Administer multiple dose oral activated charcoal and measures to control emesis. Monitor the patient and obtain serial theophylline concentrations every 2 to 4 hours to gauge the effectiveness of therapy and to guide further treatment decisions. Increasing the rate of theophylline clearance by extracorporeal methods may rapidly decrease serum concentrations, but the risks of the procedure must be weighed against the potential benefit. Charcoal hemoperfusion is the most effective method of extracorporeal removal, increasing theophylline clearance up to six fold, but serious complications, including hypotension, hypocalcemia, platelet consumption and bleeding diatheses may occur. Hemodialysis is about as efficient as multiple-dose oral activated charcoal and has a lower risk of serious complications than charcoal hemoperfusion. Hemodialysis should be considered as an alternative when charcoal hemoperfusion is not feasible and multiple-dose oral charcoal is ineffective because of intractable emesis. Serum theophylline concentrations may rebound 5 to 10 mcg/mL after discontinuation of charcoal hemoperfusion or hemodialysis due to redistribution of theophylline from the tissue compartment. Peritoneal dialysis is ineffective for theophylline removal; exchange transfusions in neonates have been minimally effective. The steady-state peak serum theophylline concentration is a function of the dose, the dosing interval, and the rate of theophylline absorption and clearance in the individual patient. Because of marked individual differences in the rate of theophylline clearance, the dose required to achieve a peak serum theophylline concentration in the 10 to 20 mcg/mL range varies fourfold among otherwise similar patients in the absence of factors known to alter theophylline clearance (e.g., 400 to 1600 mg/day in adults <60 years old and 10 to 36 mg/kg/day in children 1 to 9 years old). For a given population there is no single theophylline dose that will provide both safe and effective serum concentrations for all patients. Administration of the median theophylline dose required to achieve a therapeutic serum theophylline concentration in a given population may result in either sub-therapeutic or potentially toxic serum theophylline concentrations in individual patients. For example, at a dose of 900 mg/d in adults <60 years or 22 mg/kg/d in children 1 to 9 years, the steady-state peak serum theophylline concentration will be <10 mcg/mL in about 30% of patients, 10 to 20 mcg/mL in about 50% and 20 to 30 mcg/mL in about 20% of patients. The dose of theophylline must be individualized on the basis of peak serum theophylline concentration measurements in order to achieve a dose that will provide maximum potential benefit with minimal risk of adverse effects. If the patientâ€™s symptoms are well controlled, there are no apparent adverse effects, and no intervening factors that might alter dosage requirements (see WARNINGS and PRECAUTIONS), serum theophylline concentrations should be monitored at 6 month intervals for rapidly growing children and at yearly intervals for all others. In acutely ill patients, serum theophylline concentrations should be monitored at frequent intervals, e.g., every 24 hours. A. Infants <1 year old. up to age 26 weeks; divide dose into 3 equal amounts administered at 8 hour intervals. >26 weeks of age; divide dose into 4 equal amounts administered at 6 hour intervals. Adjusted to maintain a peak steady-state serum theophylline concentration of 5 to 10 mcg/mL in neonates and 10 to 15 mcg/mL in older infants (see Table VI). Since the time required to reach steady-state is a function of theophylline half-life, up to 5 days may be required to achieve steady-state in a premature neonate while only 2 to 3 days may be required in a 6 month old infant without other risk factors for impaired clearance in the absence of a loading dose. If a serum theophylline concentration is obtained before steady-state is achieved, the maintenance dose should not be increased, even if the serum theophylline concentration is <10 mcg/mL. 10 to 14.9 mcg/mL If symptoms are controlled and current dosage is tolerated, maintain dose and recheck serum concentration at 6 to 12 month intervals. * If symptoms are not controlled and current dosage is tolerated consider adding additional medication(s) to treatment regimen. *Dose reduction and/or serum theophylline concentration measurement is indicated whenever adverse effects are present, physiologic abnormalities that can reduce theophylline clearance occur (e.g., sustained fever), or a drug that interacts with theophylline is added or discontinued (see WARNINGS). Theophylline Oral Solution, USP 80 mg/15 mL is an orange-flavored, clear, colorless to slightly yellow solution. Each 15 mL (one tablespoonful) contains 80 mg theophylline anhydrous. Store at 20° to 25°C (68° to 77°F); excursions permitted from 15° to 30°C (59° to 86°F) [see USP Controlled Room Temperature].